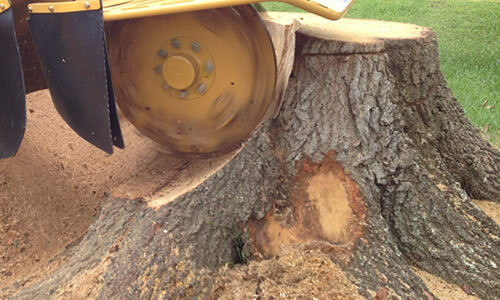 How does Arbor Tree Care perform stump removal in Saint Louis, MO? Firstly, before anything relating to the stump can be addressed, professionally performed tree removal in Saint Louis, MO is necessary, of course. Once this is completed, all the rocks and tough roots which remain in the area must be removed or dug up to prevent damage to the blades of the equipment or your lawn. Then trained Arbor Tree Care arborists take a chainsaw to trim what's left of the tree as close to the ground as possible, ideally it would be flush with the ground though that’s not always possible. That’s when the industrial machinery comes in. The goal is to slowly grind from one side of the stump to the other, pausing every now and then to clear the dirt away from the sap. Afterwards, raking all the wood chips to be flush to the ground will create the perfect environment for a brand new garden or lawn to be planted.